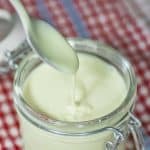 Keto Condensed Milk Recipe - Sugar Free "Naturally Sweetened"- Easy To Make! Sweetened Condensed Milk is such a versatile ingredient and used in many dessert recipes. But we can't have the sugar here if we want our recipes to remain "Keto Friendly". So we have created a naturally sweetened no sugar keto version for you. Bring to the boil, whilst whisking, then drop to a simmer. Simmer the ingredients for 30 minutes or until reduced 3.5fl oz/100ml. Pour the sweetened condensed milk into a heatproof container and cool in the fridge. The mixture will thicken up as it cools. You can use the mixture after 1 hour. We make it the day before and use it for other recipes.